What Goes 25mph and Giggles all the Way? 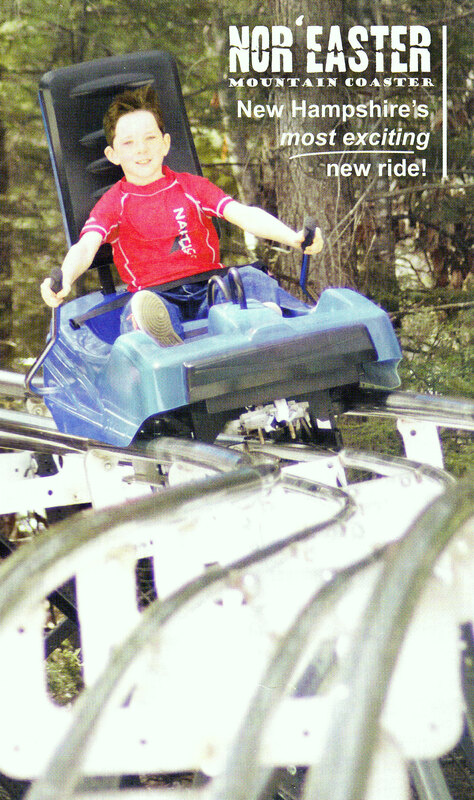 There’s a mountain coaster in New Hampshire, you say? I don’t entirely understand what that means, but I’ll be there. I’ll be the one with adrenaline giggles. Attitash Mountain Resort offers winter-time activities like, well, skiing. They also have other ways to enjoy the rush of going down a slope for those who aren’t skiing-inclined (AKA: me), and that includes a contraption called a mountain coaster. 25 MPH speeds, curves, arcs. And thankfully, the ability to apply the brakes. Bring it on–I have the need for speed. But apparently only until the first curve. Holy no sense of control, Batman! So I braked and learned that it’s actually scarier to take curves slowly. See–you’re suspended at a catywompus angle. Very high. Braking gives you (unwanted) time to examine this precarious situation, and no seatbelt tightened by a teenage employee could make me feel secure. So I released the brake. Whoosh. Adrenaline giggles. I may not comment often, but please know I read every new post and enjoy your blog very much! !